This is a book that has the expansion of time as its essence. Not the creation of time, as in there is never enough, but in the understanding that time has personal boundaries, as much as it does impersonal boundaries. To take moments of your day in order to not contemplate what you didn’t achieve yesterday, and what you will have to try and achieve tomorrow, to let the moment of ‘now’ wash over you as the only moment, to worry less, and smile more at simple procedures of contentment, this is at the core of Slow Stitch. Slow Stitch, or to give it its full title Slow Stitch: Mindful and Contemplative Textile Art, is a newly published book by the textile artist Claire Wellesley-Smith. Claire teaches extensively, working in adult education, schools, community-based projects, museums, and galleries. She runs workshops that involve the ideas of sustainable stitch, repurposed cloth, and traditional techniques of hand production. It is no surprise therefore, that her new book Slow Stitch, should concentrate on the self-same ideas of sustainability, repurposing, and the techniques of hand production that can be brought into the world of textile art. 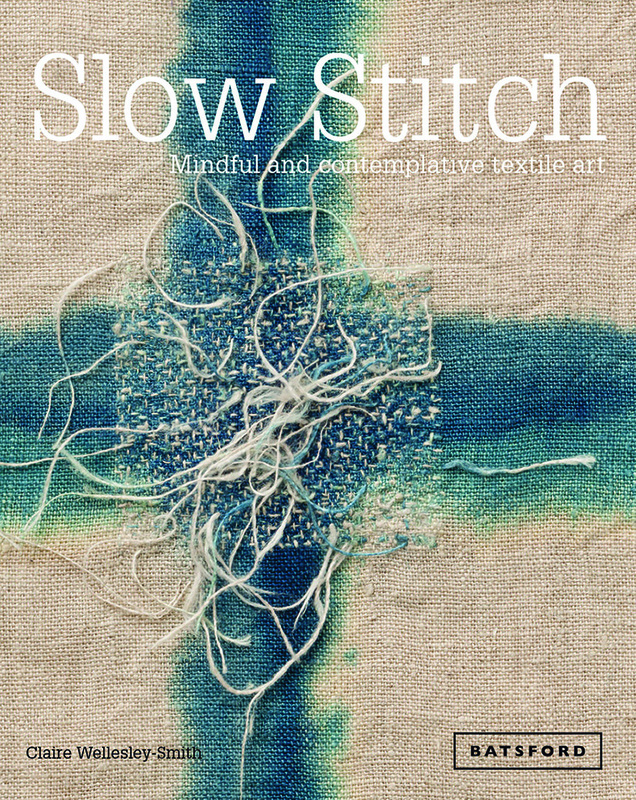 To understand Slow Stitch is to understand calmness, contemplation, and mindfulness. To understand these, and more importantly, to integrate them into our lives, is to understand that it is OK to unwind a little, that it is OK to place the demands of the twenty-first century to one side, at least for part of your day. Stitch, and the art of hand stitch is a great and simple means in which to enter the world of the momentary, of the mindful and contemplative world of calmness. The repetitive rhythm of stitch, producing single moments one after the other, can be likened to listening to the ocean waves, to taking note of slow and steady breathing, the beat of the planet. It is an exercise in purposeful motions, of creating moments, rather than being led by them. Creating stitch, is creating a path, creating a set of elements that can remove you from the world of the twenty first century. It is measured time, whether self-measured, or measured by the task, it becomes the same thing in the end. Through a range of parts and chapters Claire shows us how so many aspects of textile art can easily be slowed down, treated with respect and calmness. She shows us how taking note of time, energy, the place that you inhabit while working, can all have an effect on the process, and the result of the process. Whether working with local materials, repurposing old textiles, natural dyeing, the use of hand stitch and other traditional techniques, all add and accumulate, all move the maker and artist in a direction that has purpose, has meaning. Claire includes in her book a range of practical projects such as stitch journals, mapping local walks in stitch and found objects, and working with other artists, all part of an attempt to seriously encourage textile artists, or those artists who choose to integrate an element of textile art into their work, to make reconnections with their love of textiles, with their local culture and their local environment, all for the betterment of creativity.